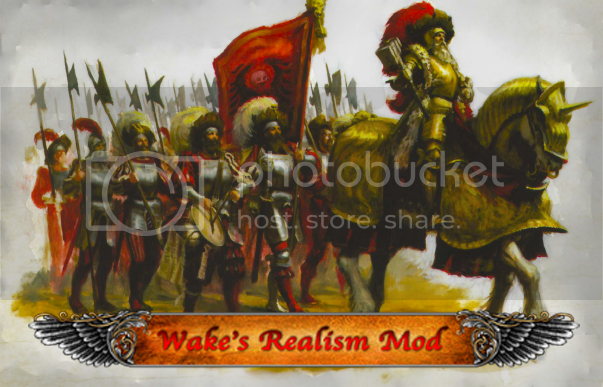 A mod aimed at making the game more 'realistic' and enjoyable for those players who dont like to continueing trend towards arcade style play. Also attempts to keep lore as a foundation for changes. * a completely new magic system wherein the spells themselves do much more damage or are much more devestating but also have a much higher chance of killing the caster should they not be powerful enough to attempt the spell. Variation in damages for some spells such as spirit leech. A skill tree amongst spellcasters where they can become more powerful and thus attempt larger spells safely and also accumulate more magic. Mannfred and gelt have the highest access to this chain and thus are the most powerful caster in game currently. * A complete revamp of the combat system, expect battles to last anywhere from 20 minutes to an hour based on tactics and force compositions. * bows are fast firing but low ap, good for lightly armoured mass infantry. Longbows have great range and some ap. Crossbow short range and medium ap. * all LL have been adjusted heavily and most importantly ever piece of LL gear has been adjusted. 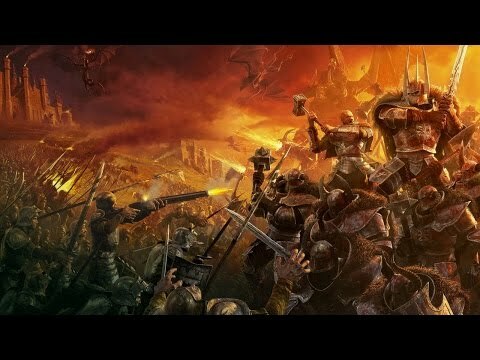 Now Archaon is the single most powerful character in game with all of his LL gear. Etc. * all heros have been heavily adjusted to more realistic values. Human heros arent particularly strong in comparison to other humans now and are no match for vampires who are amazingly strong and destructive. * vampires and undead are now immune to fatigue. Vampires regen health and are no very very lowerful melee combatants. * undead actually act like undead now. Zombies shamble at incredibally low speeds do little damage but are tanky. Skeletons shuffle slower than humans walk and arent as good as them man for man but are much less expensive to buy and maintain. * no longer do all heros have AOE attacks instead heros/lords with great mass or that are huge recieve these attacks while things like humans can now only attack one person/thing at a time. Greatly reduced hitpoints among foot generals/heros. * formed attack for the more organized units (mostly human/dwarfs) and loose formation for most units in game. Look for pike wall and shield wall in a soon future update. I would like to clarify that this is still a WIP and will change greatly going forward. We update regularly and with large changes to existing mechanics. Please see our changelog on steam for examples. - Short bows (mounted bows, goblins...) short range, low AP, fast RoF. It's easy to shoot fast with bows, but it's extremely tiring. Depending on the historical source, they are either better at penetrating armour, or not, than regular bows. They however shoot further and don't lose power at long range, and require more strength to pull. Same thing, the armour busting myth is really not true. However, they were extremely accurate which is why they were great in sieges, but poor in open terrain. Gunpowder weapons are all about the shock and awe effect of the volley fire. They tear flesh but are rather poor at penetrating armour (especially on pistols) and reloading those on horseback must be a chore. Same as pistols, except there are more guys shooting. Those volleys of gunpower weapons should shred morale and flesh, but easily get stopped by armour. Ideally, even with rather minimal damage, they should almost break a unit, but only get one chance at a volley before the enemy gets into melee range. Im well aware of what can penetrate plate and what cant. Im an armoursmith. Why dont you try the mod and then offer suggestionz, you might be pleasantly suprised. They are flintlocks not arquebus's. I intend, after the patch hits, to have a look. No point before a patch. New update includes first pass of generals bodyguard units. this looks awesome, would it be possible to add a tactical retreat type ability where a unit holds its line while slowely moving backwards? Not as of yet no. Is there a change log since the initial update. I know this MOD has been out for awhile. Yes the change log on the steam mod page is up to date. Hi, re-writing this message, with a question. Just wondering, i have seen many custom map mods out there that are for pvp that are really big and immersive wich gives you a lot of different options depending on the type of army you have. giving you the possibillity to just be an awesome general being able to defeat greater armies because of great usage of troops in any given terrain. point being, there are some awesome maps out there that would be great to have in the campaign, as i am not much of pvp player. i dont know many people that play the game. Are battle fields/maps, or rather making them more immersive and bigger, with chokeholds, tough terrain and all of this is in the works for the future? There is a large community effort to make battle maps for the campaign. Look up GCCM on steam workshop. Ive already submitted some maps to their project and I definitely plan on making more. The Mod is currently out of date as we re tool the entire infrastructure to make updating easier in the future. That said this is a long term project that strives for quality so I cant give any firm dates.